Dr. Lalita Joshi, a retired Br .Gen. of Nepal Army Medical Corps with strict principals, simple and honest is driven by a deep love for her son Ashish, born some 22 years ago with Down Syndrome. 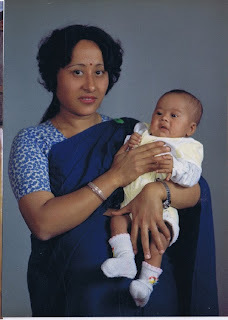 She married Dr. Prabhu Joshi, an anesthesiologist, in 1980 and their first son, Amit, was born in 1981. Amit completed his MBA in the US and is now working for an investment company in Nepal. In 1989 Lalita became an OB-GYN. In 1991 their second son Ashish was born. For 14 days Ashish was in NICU before he was able to come home. He possessed some facial features of a child with Down Syndrome and although the family suspected something, there were no real issues. When Ashish was three the family went to Madras for an elder sister's renal transplant. At that time Ashish was tested and it was confirmed that he had Down Syndrome. Fortunately for the Joshi's, Ashish has been accepted by all family members who refer to him as Lakshan Kobacha or lucky child. The most common type of Down Syndrome is called Trisomy 21, which accounts for about 95% of people affected. Ashish has a less common type, known as Mosaic, which is a milder form of Down Syndrome enabling him to function at a much higher level. In 1995 Lalita accompanied her husband while doing Cardio -thoracic anesthesia training in Sydney, Australia . She also got a chance to do training in Infertility in Paddington Royal Women Hospital where she met Dr Stephen Horrowitz OB/GYN , her mentor. He too had a son with Down Syndrome. Dr Horrowitz provided Lalita with the latest information on Down Syndrome along with a book written by a Pediatrician, Prince of Wales Children Hospital, Sydney and VCD on early Intervention developed by Macquaire University. All this helped her immensely to take care and train her son bringing him to hispresent independent and confident position. When Ashish was five years old he attended The South Point Boarding School in New Baneshor. The school didn't know that Ashish had Down Syndrome, as Lalita had kept this hidden for fear of him not being accepted by others. At age 11 the school realized that something wasn't quite right with Ashish and that he had some learning disabilities. Lalita spoke with the principle and told him the truth., that Ashish had Down Syndrome. Instead of rejecting him, the school decided to keep Ashish and take on this "challenge". The teachers, other parents and children treated Ashish with a great deal of respect, often helping him with his homework. Ashish stayed at South Point until he was 18. He sat for his SLC but couldn't clear it. Ashish at 22 has a full life and attends aerobics training twice/week, keyboard (music) training 3x/week and basic computer training. He also attends painting classes. Lalita continues to look for avenues in which Ashish's real talents can come out. Ashish is getting home training from an occupational therapist who comes to the home once/week which has helped him to handle money and independently takes public transport. Unlike in India where I spent three years working in the field of development disability, In Nepal there are few services specifically focused on people with Down Syndrome. Because of this and the goal of wanting more for Ashish, in 2006 Lalita founded the Down Syndrome Association of Nepal (DSAN). Lalita says that "If every child matters, every child has the right to a good start in life. If every child matters, every child has the right to be included. And that is so important for children with special needs." DSAN's vision is a Nepal where children with Down Syndrome can grow up to be independent, based on their capabilities, and be respected and productive members of society. In Nepal there are no official figures on the number of children/adults living with Down Syndrome. Lalita isn't sure of the exact scope of her work but the goal of DSAN is to create awareness regarding Down Syndrome and opportunities for those living with DS. Lalita also provides pre-conception and pre-natal counseling to high risk couples who have the chance to give birth to a child with DS and also translates Down Syndrome documents into Nepali, of which there aren't many. Lalita's dream and major focus is to develop an early intervention centre which will provide therapies and trainings so that more people can have an early start in life helping them to become more independent and reach their own potential. Lalita is also concerned about providing services for a full "life-span approach" in order for people with Down Syndrome to lead a full life. Drs. Lalita and Prabhu Joshi want to find a partner for Ashish and hope that one day he will get married. They would like Ashish to have a small business in order for him to earn and be able to live on his own once they are no more. In the end this is nothing more than any parent would wish for their children. • Down syndrome is a chromosomal condition that is typically caused when a baby is conceived with 47 chromosomes instead of the normal 46. Starting in the womb, this additional genetic material alters the course of the child's development. • The most common form of Down syndrome, Trisomy 21, occurs when a child is born with a full three copies of the 21st chromosome, rather than the normal two. In rare cases, Down syndrome is caused by other chromosomal arrangements. • Children with Down syndrome typically have intellectual disabilities, hypotonia (low muscle tone) and characteristic facial features, such as upward slanted eyes and a flattened nasal bridge. • Except for Translocation Down syndrome, which occurs in about 4% of people with Down syndrome, the condition is not inherited, which means that it doesn't run in families. • Down syndrome (or Trisomy 21) accounts for ninety-five percent of people with Down syndrome. A child with Trisomy 21 has three copies of chromosome 21, rather than the normal pair. • Translocation Down syndrome accounts for just three to four percent of people with Down syndrome. Translocation is what people are referring to if they say that the condition is inherited, because usually one parent is a carrier. The extra #21 chromosome is present, but attached to a different chromosome in the egg or sperm. The clinical features of people with Translocation Down syndrome are indistinguishable from those with Trisomy 21. • Mosaic Down syndrome accounts for less than one percent of all people with Down syndrome. Children born with Mosaic Down syndrome have some cells with three copies of chromosome 21 and some cells that have the usual pair. Clinically, babies born with Mosaic Down syndrome can have the same features and health problems seen in babies born with Trisomy 21 or Translocation Down syndrome .However, the presence of cells with the normal number of chromosomes may result in fewer characteristics of Down syndrome.